Adult unicorns are extremely skittish of humans unless raised around them. They're able to sense a magi's inner feelings, and will never approach a person with dark intentions. With a single, wickedly sharp horn and strong hooves, they're more than capable of protecting themselves from those who wish them harm. Don't be fooled by the beauty of these creatures; if threatened, the creature or animal foolish enough to take on a unicorn will understand how their horns are potentially fatal weapons, easily piercing the most durable of leather or fur. With a shiny coat softer than any horse's, this creature is a joy to ride. 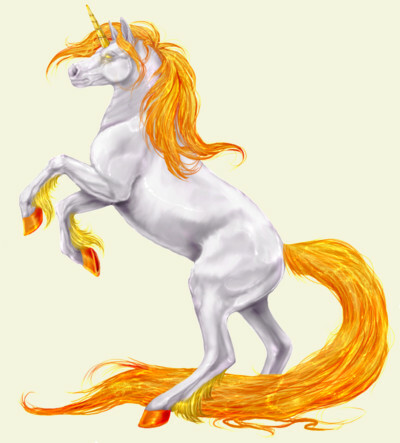 Swifter and more dangerous than a normal horse, this unicorn is capable of traveling at breakneck speed, and loves nothing more than a ride through the forest. They live deep in the forest, extremely shy and mysterious; their horns were once highly sought after by poachers for their healing magic. Able to neutralize any poison, they were threatened with extinction and hid themselves away in the Silva Forest, a place so dangerous only the most brave dared enter. Sweet and gentle by nature, unicorns are one of the most valued companions, for they mark out a magi that is pure of heart and of soul.